Dr. Paul Levine is a leading expert in Orthokeratology and Myopia control. He is nationally and internationally recognized as a leader in the field. He is the President of the American Academy of Orthokeratology and Myopia Control (AAOMC) and is also a fellow of that Academy. He is the first Optometrist in Massachusetts to achieve fellowship in Orthokeratology. He also sits on the Board of Directors as Treasurer of the International Academy of Orthokeratology and Myopia Control (IAOMC). Orthokeratology, commonly known as ortho-k, is a method used to correct vision problems by wearing rigid gas permeable contact lenses overnight, so that no vision correction is needed during daytime hours. FDA Approved gas permeable (GP) retainer lenses specialized for ortho-k are inserted at bedtime and worn as you sleep. Throughout the night, the lenses temporarily and gently reshape your cornea so that your vision becomes clear the following morning. The correction is temporary and neither eyeglasses nor contact lenses will be needed for the the next day. In order to maintain clear vision on a daily basis, the retainer lenses need to be worn every night. Ortho-k is FDA approved for patients of all ages. The best candidates are young nearsighted children whose eyesight is getting worse at every eye exam. Though not specifically approved for myopia control, studies have shown this modality to be an effective method of slowing down the progression of myopia in children. Ortho-k is also recognized as an effective alternative to traditional modes of correction for adults including vision correction surgery. Individuals of all ages with healthy eyes can try ortho-k as an alternative to daily wear contact lenses and eyeglasses. The effects are non-permanent and reversible. The ideal goal is to provide 20/20 vision without any need for eyeglasses or contact lenses during the day. Most patients achieve this, though certain conditions may limit the total amount of vision improvement such as high astigmatism, high myopia and hyperopia. Baseline corneal shape is also a contributing factor. Computerized corneal topography testing is an essential component in assessing one’s candidacy for ortho-k. Note that although improvement in vision is generally reported within a day or two of wearing ortho-k overnight, the full effects may not be experienced until the lenses are worn for a few weeks. During this transition period, your vision may not be as crisp as it was with regular contacts or eyeglasses, and glare or halos around lights may be visible. Until ortho-k works fully, a temporary pair of eyeglasses or soft contact lenses may be required for specific actions, such as driving at night. Although some people have trouble wearing regular gas permeable contact lenses during the day, ortho-k lenses are worn while sleeping – so discomfort and awareness of the lenses is generally not an issue. 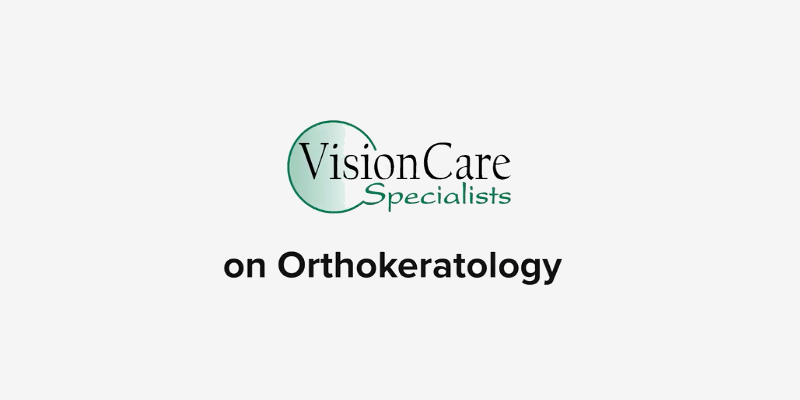 Orthokeratology programs require several office visits and a high level of expertise that most general eye doctors do not possess. The sub specialty takes years of study and ongoing education. The retainer lenses are custom designed to each patient’s unique eye shape through very sophisticated measurements utilizing computerized corneal topography data. Ortho-k retainer lenses and fitting fees are more costly than with standard contacts, however, one pair of lenses replaced annually cost less than a one year supply of daily disposable contact lenses! Additionally, Ortho-k wearers do not need to replace eyeglasses annually so that the long term costs tend to be lower with Ortho-k.
Refractive surgeries, such as LASIK, are possible after treatment with ortho-k lenses. Since ortho-k works to reshape your cornea, you are required to stop wearing the lenses for several months before undergoing LASIK. This allows your eyes to return to their original shape. It’s important to inform your LASIK surgeon if you’ve been wearing ortho-k lenses and you will be advised as to how long of a wait is necessary before having the laser procedure.